- a new certificate program @ ORI - with Dr. Susan Kavaler-Adler - offered for in-person and virtual participation. This program consists of three 10-week trimesters, which can be taken as separate certificate courses, each earning 12hrs of continuing education/ post-graduate credits. Current Clinical Object Relations Concepts: Transitional time phenomena; Holding environment; Holding environment and the treatment of the narcissistic character; Psychoanalytic container and the analyst as psychic processing container; Hate in the countertransference; Attacks on linking; Envy and ‘oral’ envy; Envy and current theorists; Oral envy in the narcissist; and True and false self. Transitional time phenomena: the subjectivity of time, and time as an object. Read: A) S. Kavaler-Adler, “Dialectics of mortality and immortality: Time as an internal and transitional world experience. Time as a persecutory vs. a holding object” (Issues in Psychoanalytic Psychology, 35, 37-61); B) F. Summers, “Temporality and futurity in the psychoanalytic process” (in The Psychoanalytic Vision: The Experiencing Subject, Transcendence, and the Therapeutic Process, 2013, pp. 109-125). Read: A) D. W. Winnicott (1958)on the holding environment – in “The capacity to be alone” (International Journal of Psycho-Analysis, 39, 416-420; re-published in Maturational Processes and the Facilitating Environment, 1965); B) S. Kavaler-Adler, “The case of David: Nine years on the couch for sixty minutes, once a week” (American Journal of Psychoanalysis, 65, 103-134). (Journal of the American Psychoanalytic Association, 24, 285-307). W. Bion offered a concept of the analyst being not only “holding,” but also actively processing psychic “container.” The analyst processes the Beta (concrete) experience into symbolic level of Alpha experience. This relates to Melanie Klein’s idea of transformation from the paranoid-schizoid to depressive states. Read: W. Bion (1970). Attention and Interpretation (pp. TBA). 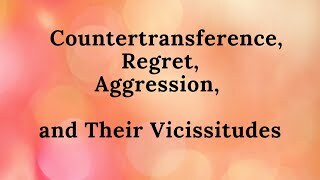 Hate in the countertransference is concept introduced by D. W. Winnicott in his article with the same title. Read: Winnicott (1975), “Hate in the countertransference,” in Through Pediatrics to Psychoanalysis, pp. 194-203. W. Bion’s concept of “attack on linking” was introduced in his article with the same title. Read: Klein (1957). Envy and Gratitude and other works (1946-1963) (pp. TBA). Read: S. Kavaler-Adler (1998). “Vaginal core or vampire mouth. The visceral level of envy in women: The protosymbolic politics of objects relations.” In N. Burke (Ed.). Gender and Envy (pp. 221-238). Read: Winnicott (1965). “Ego distortion in terms of true and false self” (In The Maturational Processes and the Facilitating Environment, pp. 140-152).